I'm sure many of you saw this on social media, but I wanted you to hear it directly from me, too. Time to gird my loins and have my George R. R. Martin moment. Okay, so there's brilliant news, and there's also some not-so-good news. Let's do the not-so-good news first. The Song Rising is now coming out in March 2017. First off, I am really sorry for this delay. I know the original date of November 2016 came as a shock to some of you, after you spent a year waiting for news, and March 2017 sounds so much farther away. Two years and two months is a long time to wait between books – The Mime Order was out in January 2015 – and you've already been enormously patient. I completely understand that many of you will be disappointed. I've always wanted this blog to be a place for me to talk frankly about publishing a book. The highs and lows. The complications. In the spirit of that honesty, I wanted to use this opportunity to show you that sometimes, things don't go exactly as you envisioned them – but also that it's sometimes for the best. Various things that are out of an author's control can delay the publication of a book. Originally, I thought Bloomsbury had chosen to delay the release for some of those reasons. However, I have concluded that this delay is, in part, because The Song Rising's first draft was not as strong as it should have been. I didn't realise that at the time, but when I looked back on recently, I could see that it was lacking a strong core. There was a lot of great material, but something was just . . . not there. I felt the same reading it as I did when I read a very early version of The Mime Order, which I scrapped and never sent to Bloomsbury. It was like all the flesh and muscle and bone was there, but something was missing to bind them together. In hindsight, I think the root cause of this was simply that I rushed to send it to my publisher as soon as I'd finished a first draft – and it was literally a first draft, with minimal self-editing. It was hot off the keyboard when it landed in my editor's inbox. I raced to send it off because I didn't want my readers to have to wait a year and a half for the next book in the series. I assumed my editor would get back to me at top speed, as she did with The Mime Order. I desperately wanted Book 3 to come out in early or mid-2016. As a result, I sent Bloomsbury a draft that could have been better, which meant that my editor took longer to get through it and get back to me, which negated any time I'd saved by rushing to send it to her. Cue the long wait for notes and multiple rounds of edits that I've had to do over the past few months. I now recognise that if I'd taken a month or two to do a few self-edits beforehand, things may have moved faster. In short, by trying to get the book to my readers quickly, I slowed things down. Lesson learned. So here's what's happening now. The finished manuscript is due for April, and I'm on target, so I am nearly there. I am working around the clock, feeding myself mostly on Lucozade, to ensure I don't miss these final deadlines. Now, you may be asking, ‘Why can't they just publish it in April or May?’ Well, they technically could, but publishers also need a while to promote an upcoming book. First, the finished manuscript has to be presented to, and read by staff at the publishing house; then it has to go out to early readers, bloggers, media, and so on – all sorts of things to make people aware that the book exists, and that it's coming out, and that they can read it soon. It also needs to come out at a time of the year when the publisher feels it will sell well; it can't just be shoehorned into the calendar at the earliest possible time. You can think of these in-between months, the bridge between finished manuscript and publication, as the book warming up before a race. It's preparing to go into readers' hands, and it needs the best possible start. On a personal level, I've come to understand that I need to accept my boundaries as an author. I pour my whole heart and soul and life into my books. When my publisher first told me that it would have to come out in March 2017, I was distraught. I had been working so hard to get the book finished, and I have always wanted to be the sort of author who could get them out on a yearly basis – but sometimes, certain stories take a while to tell. And The Song Rising has been one of those stories. Blood, sweat and tears have gone into getting this book right. It's more ambitious than The Bone Season and The Mime Order in terms of its scope, set in three different cities and dealing with many different characters and factions, so it was always going to take slightly longer to tease out and refine. It's the book that lifts the series onto the global stage, where the stakes are much higher. It's taken me a long time to accept that a larger story might take longer to get right; I equated being a bit slower with failure, and I shouldn't have. Something I've finally learned from this experience, which I'd like to pass on to any aspiring writers reading this blog post, is that it's okay, and usually the best approach, to take your time when you're creating. I genuinely believe that Book 4 will take less time to write. It will almost certainly be the shortest Bone Season book before the monster-sized Book 5. But I'm not going to make any promises this time about getting the books out once a year, because I don't want to break those promises. I have to accept that these books will take as long as they take if they're going to be of the best possible quality, and I hope you guys will understand. I never want you to have anything less than my best work, and I never want to hold a book in my hands and know it could have been better, if only I'd taken a few weeks or months longer to get it exactly right. So, March 2017. I imagine some of you will be able to get hold of ARCs before that, but it's still pretty far away. I'll be twenty-five by the time it comes out. Fortunately, Bloomsbury and I have some plans to help tide you over to Paige's next adventure. 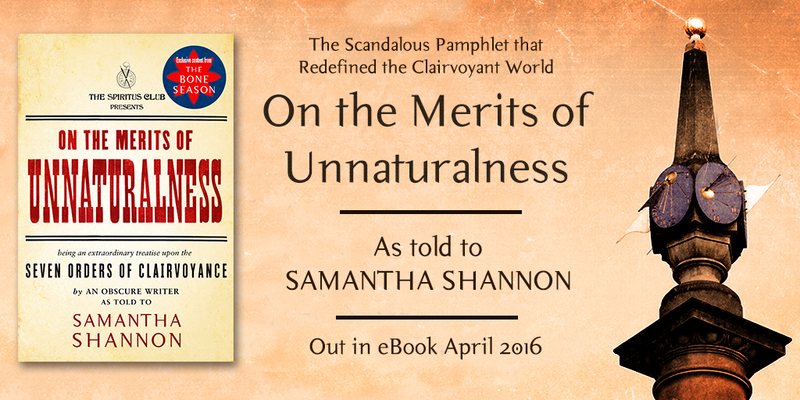 On the Merits of Unnaturalness is officially coming out as an eBook! On the Merits is the controversial first pamphlet by Jaxon Hall, written under the pseudonym An Obscure Writer, which explains all of the clairvoyant gifts in The Bone Season from his perspective. You may remember that we did a limited pre-order campaign for The Mime Order, where the first 500 people to pre-order got a physical edition of On the Merits, which was only available to a small number of territories. BUT NOW, On the Merits will be available for a from all reputable eBook retailers this April. Yes, Jaxon Hall is coming to a Kindle, Kobo or iPad near you. Even better news: my publishers in other territories around the world have also been given the go-ahead to publish it, so it may even be getting translated. When and how they choose to do this is up to them, but I'll make sure I put any information up here when I receive it. I'm so, so pumped about this, and so happy I can share it with more of my readers. I had a hell of a lot of fun writing On the Merits, and I think it's a great resource for those of you who want to learn more about the world of the books. There's also another very exciting piece of Bone Season news coming later in the year. I can't give you exact details just yet, but let's just say . . . it's something else for you to read. Keep your eyes peeled for an announcement at some point. And for Song Rising teasers as we creep closer to publication. Thank you, as always, for your endless patience, kindness, and understanding as I work through this last stretch of editing. I am very lucky to have such brilliant readers, and I hope you'll always feel as if the wait for my books has been worth it. Thank you for your honesty !! Even though I cannot wait to read The Song Rising I'm happy to know you're doing your best to deliver an amazing novel. Don't worry about us, we will be fine, I'm so excited to read all the books you will publish in the future. Good luck with that !!!! I shall be buying it on release day whatever day that ends up being and I would rather read the book you want to publish - so thanks for taking the trouble to update us and I shall continue to look forward to it. Aaah I'm so sad that there's a delay. But I understand the situation completely and will keep waiting patiently for it to come out. You're an amazing writer and it takes a lot of time develop such amazing books. It's better to wait than to be dissapointed by the book. And I'm super excited for the Merits on Unnaturalness!!! I loved the last two books and can't wait to read this third installment. I want to love it equally as much and therefore don't give a damn how long it takes you. Relax it's all good. Hi Samantha. I left a comment yesterday, but I don't seem to be able to see it for some reason, so I'll try again. The gist was that you should try not to feel too bad. I know it must be frustrating not to have a book released as quickly as you had hoped, but it is more important that you release a book that you are happy with and I'm sure you won't disappoint. We will all be patiently waiting for it. I have very recently released my debut novel. It is only available as an ebook just now, but I am very excited that people are finally getting a chance to read something that I started five years ago. I am sure that you must get this kind of thing all the time, but it would mean so much to me if you would give it a read. I understand you must have a very busy schedule, but if you ever have an opening in your reading list and fantasy giving it a go it is a high fantasy aimed at young adults but I hope that it will be read by a wide range of readers. It is called 'Floyancy'. If you search for it on amazon you should have no trouble finding it. Thank you, and good luck with your release and the rest of the bone season series. P.S. I am looking forward to what you come up with for the high fantasy genre. Hi Linden – thank you for your kind words! I'm afraid I can't read any self-published work for legal reasons, and I also have very little time to read in general at the moment, but many congratulations on putting your work out there! I'm sure you'll find many readers, and best of luck with your writing. Don't worry, Samantha: we will wait! :) I think your honesty and the fact that you're working so hard to get things right only shows how dedicated you are. Good luck with the rest of the journey. You can do it! Ugh! This is the first book series that I'm reading as the author is writing it and the waiting is definitely unpleasant lol, but what would be worse is a book that is not your best. You can't rush greatness! I've got March 2017 marked on the calendar. Have a great year! I'm disappointed as a reader that the book won't come out until next year, but as a person I understand. I've had my fair share of broken promises, and I love how honest you were with us. I hope the editing process and these in between months go smoothly for you. I can't wait to read your next book! Then I'll be posting a review on my blog 😊 I have fallen in love with your series, and I've already gotten my old coworkers and supervisors hooked on you too! I'm sure most of us understand, as eager as we are for the next installment. Jk Rowling had us wait *years* between some of the Harry Potter books (to say nothing of the agonies of George R.R. Martin fans) and we all still adore her and her books, so we understand. :) I'll still eagerly read it as soon as it's out. Will there be another Goodreads re-read of Mime Order? 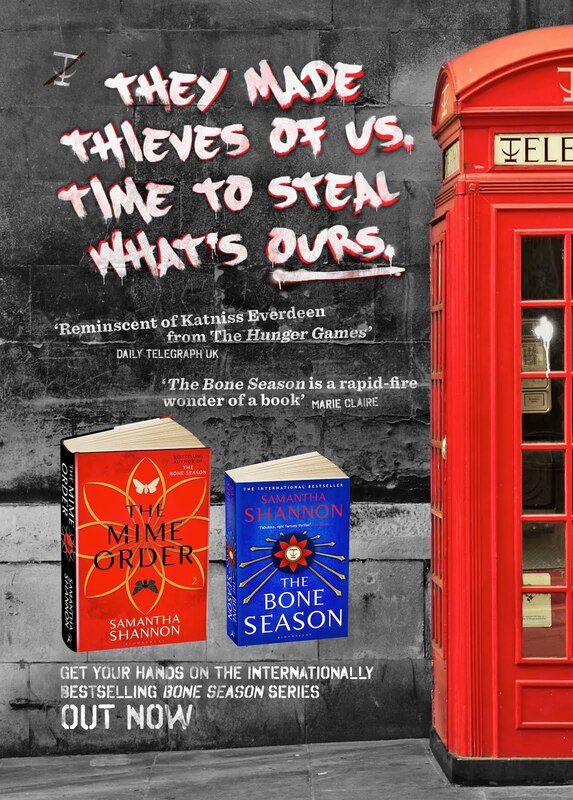 The Bone Season re-read and discussion before Mime Order was a lot of fun and helped ease the wait. I hope there will be! So I am sending out my manuscript to David Godwin via email and am confused about what to include as the subject of my email. Wish me luck! Also, how long would you say he takes to reply? Perhaps just put the title of your book and your name (e.g. The Bone Season by Samantha Shannon, in my case)? Or ‘manuscript query’? I don't think the subject line matters too much – what matters is the content of your query. I'm afraid I have no idea how long David takes to answer manuscript queries. I am dying a little and want to read the song rising.....BUT I would way rather that you kept the quality of writing high, the plots intricate and the characters well developed like the last two books. Because in reality once the series is done you can't go back and change them. Way to go for keeping these books so great!! Even if it is hard!! And it's so awesome you are so young way to go! I would always rather wait longer for the book the author wants to publish than immediately get a book the author would want to edit. Thank you!